When studying Western history, we tend to say that this European explorer discovered this continent or that island, when those lands were already long inhabited. Cartographer Bill Rankin maps out the lands that were uninhabited by time of Europe's Age of Exploration. Rankin's map covers regions that had been inhabited by humans and regions that were known of but never occupied, as well as some true undiscovered countries. (He's discounting Europe itself, which was at some point, some human's discovery, although that person or persons wasn't European at the time.) It's also interesting to see how the regions break down by nationality of the explorers and at what point different nations entered into the discovery game. Plus, there's the realization that roughly 0.05% of the human population lives in these late-discovered lands. (It also shows the incredible amount of ocean these explorers covered.) 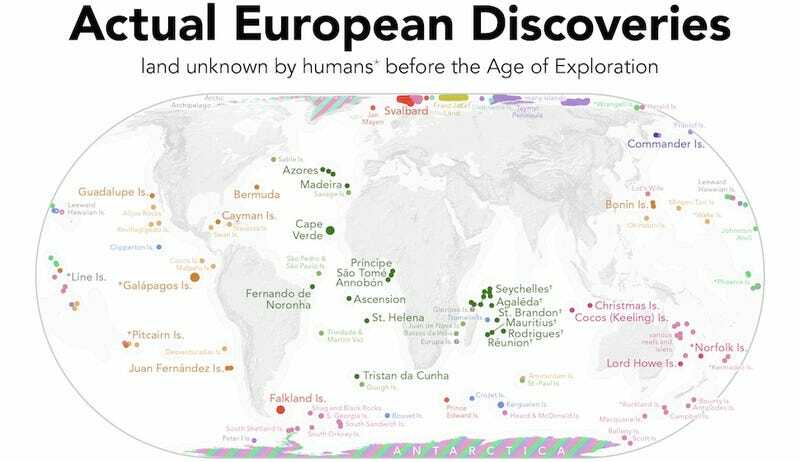 It's a very different perspective on Europe's Age of Exploration.